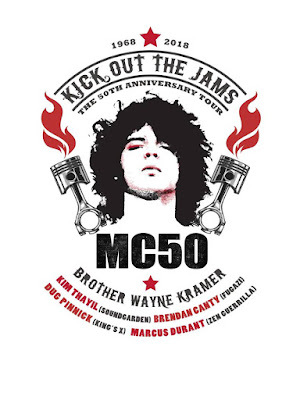 Wayne Kramer will hit the road later this year for MC50, a tour celebrating the 50th anniversary of MC5's Kick Out The Jams. Kramer will play the legendary album in full along with special guests including Soundgarden's Kim Thayil and Brendan Canty of Fugazi. Last month the October 27th tour finale at The Fillmore Detroit was announced, and now Kramer has shared the full tour itinerary which includes another -- and more intimate -- show at St. Andrew's Hall in Detroit on October 26th. The pre-sale for the October 26th show kicks off Thursday, April 5th at 10am, and the general onsale kicks off Friday, April 6th at 10am. Head here for info.